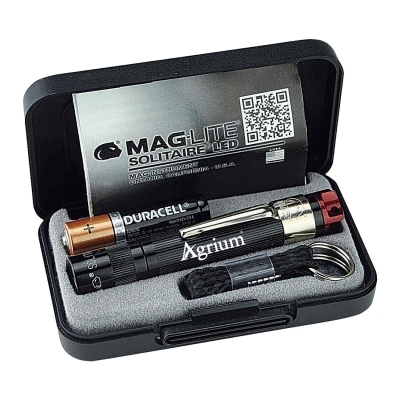 MagLite® LED Solitaire flashlight with a Red bulb to protect your night vision. Red is the preferred color to use in confined spaces at night, like airplane cockpits, truck cabins and boats. Red is at the low energy end of the light spectrum, and is easier on the eyes than white or blue lights. It comes with a handy pocket clip and a key ring-lanyard attachment. My personal endorsement for these reasons: Small size that is convenient for a key ring. Red light is easy on the eyes. Classy hinged gift box. American-made. Size: 3 1/4" long. Box is 3 5/8" long. Production time: 7-10 business days days. Rush shipping available upon request. Optional 2nd Location Engraving $1.00 (g) each plus set-up charge.